Don’t worry Sarah (and everyone else! ), this isn’t the first time we’ve been asked about changing the default web browser on the Mac, so allow us to explain the remarkably simple answer – you’ll be changed back to whatever web browser you want in no time at all, whether it’s Chrome, Firefox, Safari, or any other. Do note that making this change will impact all links opened throughout apps in Mac OS X, as all will be redirected to whatever browsing app is set as the default. Quit Safari, and you’re done. 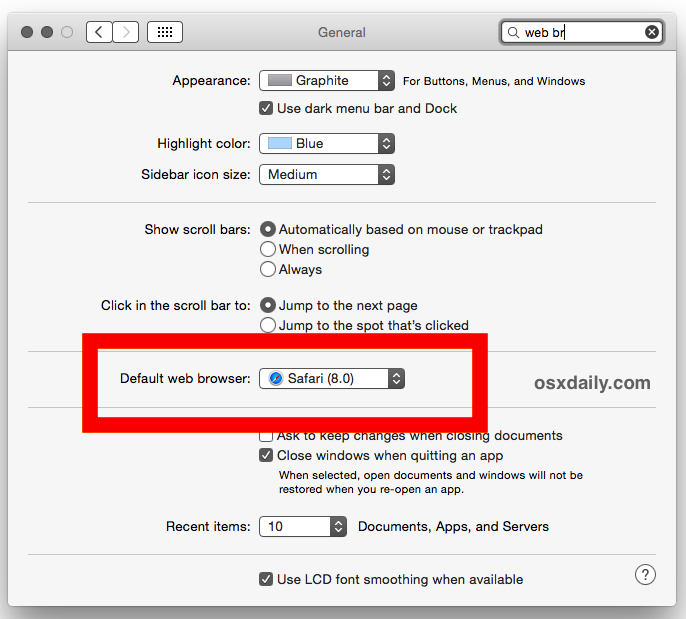 Yes, you use Safari to change the default browser, even if you have no intention on using Safari as the default and instead want to switch the default to Chrome, Firefox, or whatever else. 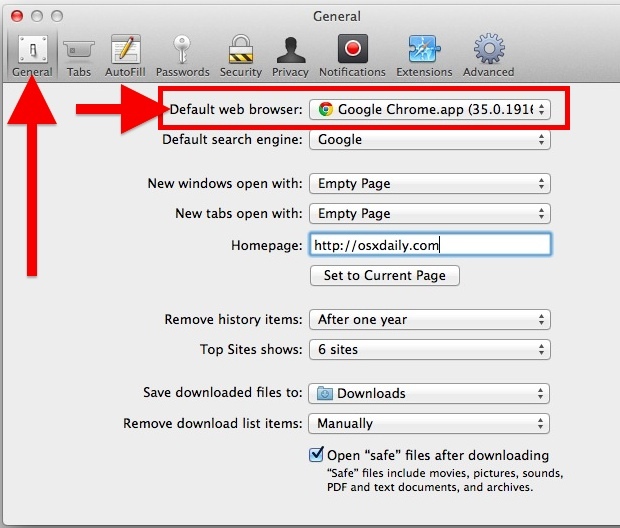 This process is identical and works for setting the default to Chrome, Firefox, Chromium, Opera, Safari, and just about any other native browser in Mac OS X. Another thing to keep in mind is that most browsers will ask you, often repeatedly on each launch, if you want to set them as the default for the web. Choosing those options within those apps will make the modification for you automatically, though to change it manually at any point you would need to return back to Safari’s Preferences. Another option is to go through the browser that you want to set as the default. This is possible because most third party web browsers apps also have an option within themselves to set their own app as the new default across Mac OS X, Chrome has this and it will ask usually upon launching the app if you want to set it as the default. Firefox and Opera usually will ask the user the same question too, so it’s really easy no matter where you start. Generally speaking, the option is always within the individual browser apps “Settings” or “Preferences” and it’s made very obvious once you’re in that panel. Again, this will impact how all links open on the Mac, so expect new links to open in whatever is set as the default. Why do you want to go back to Safari anyways…??? I downloaded Firefox and I’ve made it my default browser but every time that I restart my mac this setting automatically change to safari. Same here. Everytime I restart, the setting reverts back to Safari as being default. Thanks, I’ve just spent half an hour looking through all the settings and options in firefox! Seems like a bit of a daft place to put this setting. I appreciate the person who asked the question as simple as it may seem to cyber tech folks. The only dumb question is the question not asked and then it’s stupid. One of the things that I do appreciate is the ‘Launch Pad’ on Lion – I have three browsers and have them for specific reasons. All them are very, very different and when Firefox throws that wrench when opening their browser, I just have remember that the cleaver Fox is attempting to break again. Just say NO. It seems that OmniWeb has the same facility. i know how to do this, but no other defaults come up?, do i have to download other browsers or are pre set on to the mac? I recently downloaded a “mod installer” for minecraft, and it changed my default web browser to bing. Every time i go to change it back to google it says it has changed, but it STILL USES BING! Does anyone know how to fix this?? I have a Mac OS Version 10.5.8 and need another browser. I have tried to install Firefox and Chrome but my computer is not compatable. Any ideas? Really like Safari but cannot open sites I need. Any Idea what to do in 10.11.5 if there is no option to choose the browser? Interesting, that must be a problem with a preference file or something. If you can track down the prefs file it should resolve that and let you change the browser (not sure which prefs file to target though, it will be a plist file somewhere). Another option is to set the browser from the web browser app itself. Chrome and others offer this when you launch the app, what browser are you trying to set as the default? If Safari is already the default browser then the option to change the default browser at the top of General Prefs will not appear. 3. Go down to “Default web browser:” (Make sure whichever browser you want to make your default is installed), select it. My system is 10.6.8 which has neither a “General” option nor a “Default Web Browser” option in the System Preferences. I think these come on later versions. I am stuck on so many levels with this version that I think I may have to buy a new computer. If it not let you switch it, close both browsers and try again.